The analogue method has been implemented for real-time precipitation forecasting in the framework of flood management in the upper Rhône catchment in Switzerland. It identifies analogue days, in terms of atmospheric circulation and humidity variables, in a long archive of past situations and then uses the corresponding measured precipitation to establish an empirical conditional distribution considered as the probabilistic forecast for the target day. This method is used in different institutions for hydro-meteorological forecasting in the framework of real-time flood management or electricity production. 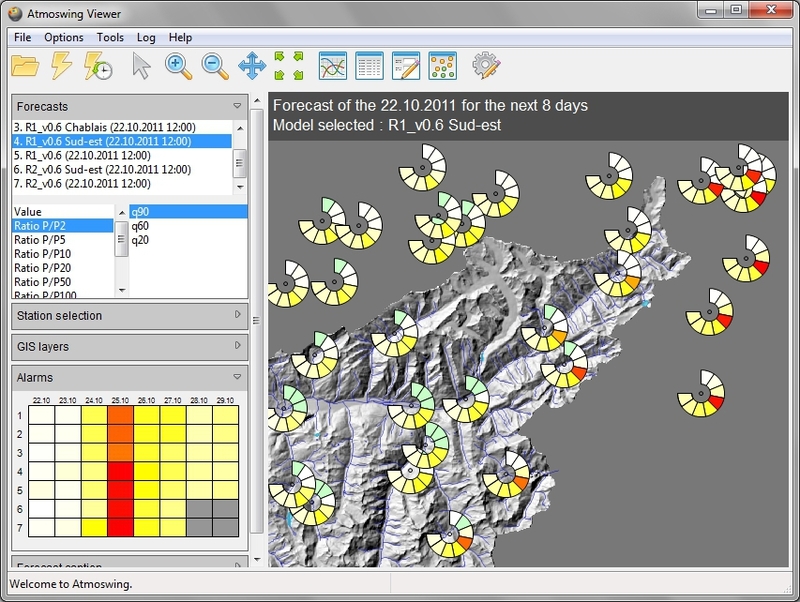 The developed software is called AtmoSwing for “Analog Technique MOdel for Statistical Weather forecastING” and is constituted of two tools: the Forecaster that automatically processes the forecast and the Viewer that displays the resulting files in a GIS environment. AtmoSwing is written in C++ and uses open source libraries. It is fully cross-platform and has the native look of the corresponding operating system thanks to wxWidgets. The model is standalone and automatically handles the download of the GFS global numerical weather prediction forecasts on which the analogy is processed. The development aimed at creating a very modular object oriented tool that can be used to parameterize any known version of the analogue method. There is no limitation on the number of analogy steps, neither on the amount of atmospheric variables used as input. The Viewer has a GIS engine that allows changing the map layers in order to be adapted to any new region. It offers different levels of detail, from an overview of all lead times and all parameterizations, which provides a quick identification of potential critical situations, to local time series and details of analogues distributions. AtmoSwing is running operationally since October 2011 in the Swiss Alps. The implemented parameterizations are the most common reference methods developed by Bontron (2004). These presented globally good results on the whole period, and forecasted in a very satisfying way some significant events. Last improvements to the parameterization by means of a global optimization technique should now even improve the reliability of the forecast. Horton, Pascal, et al. “AtmoSwing, an Analogue Technique model for statistical weather forecasting.” EGU General Assembly Conference Abstracts. Vol. 15. 2013.